This is not a great shot of the original. The original was roughly 2.5' by 3.5' in size and was done as a commission. 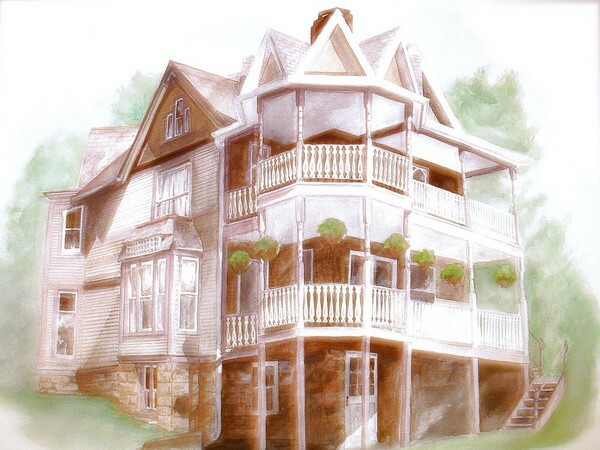 The house portrait is of a local Victorian Mansion done in watercolor. The original shows a great deal more detail and is close in color to the original house. The colors here ended up pretty muddy. I think you did a great job. Having done a Victorian House I realize the work, great light sources. Artist Reply: Thank you. It took three different shots to capture the entire house to paint it. :) It was pretty hard to capture in decent light. I took a look at your gallery. Have you been doing watercolors long?